Everybody goes online, everybody has a cell phone, and kids hate blogging and Twitter, according to a new survey from the Pew Research Center’s Internet & American Life Project. The findings show that the Internet isn’t just prevalent in our lives, it is our lives. Ninety-three percent of teens ages 12 to 17 go online, 75% of them own a cell phone, and 66% say they text. 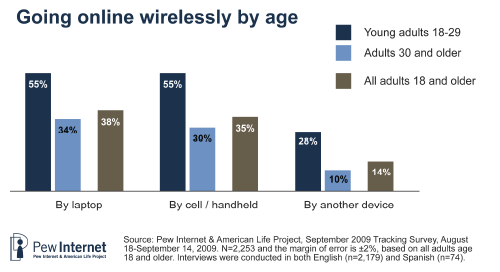 In fact, 58% of 12-year-olds now have mobiles, compared to 18% just five years ago. Sixty-two percent use the Internet to access information on news and politics, and some teens are even using the Internet as a guardian: 17% say they go online to research information about drug use, sexual health, and other topics that are awkward to talk about with real people. Social networking is up to 73% of “wired” teens, or those who use the Internet often, compared to the 55% of teens who used the sites just three years ago. However, blogging is down, with only 14% of wired teens saying they blog, compared to 28% three years ago. 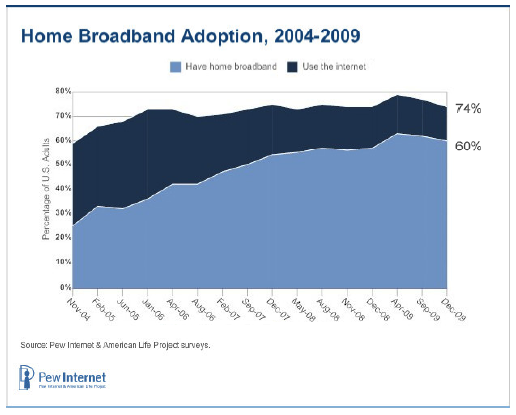 Commenting on blogs is also down to 52%, from 76% in 2006. And while Twitter may be hot with the older crowd, only 8% of teens ages 12 to 17 say they use the microblogging service. The highest percentage of teens on Twitter is 13% of high school girls ages 14 to 17, but compared to the one-third of adults ages 18 to 29 who update or read a microblogging service, the numbers are low. 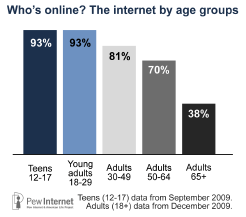 Among adults ages 18 to29, laptops are the computer of choice, with 81% accessing the Internet on a wireless computer and two-thirds owning a laptop or netbook. Ninety-three percent of 18-29-year-old adults now have a cell phone, and 93% go online. And with the rise of social networking–72% of young adults have profiles–comes the fall of blogging again, with just 15% maintaining a blog, down 9 percentage points in two years. 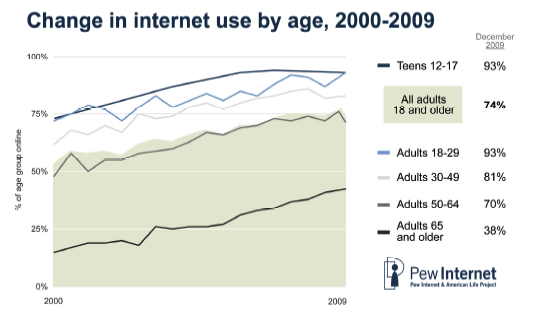 Meanwhile, blogging is on the rise for adults over 30, who increased to 11% from 7% in 2007. And 47% of adults now use social networking sites, up 10% from a year ago.